MobileLog is designed with the mobile ham in mind, placing many of the same features and functionality found in typical desktop logging applications into the PocketPC platform while minimizing keyboard tasks (such as having to enter RST via keyboard). 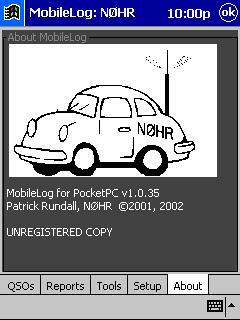 With the dramatic drop in prices of PDAs and increasing popularity of QRP, ham-backpacking and other forms of mobile hamming, MobileLog should provide many users with the satisfaction of computerized logging on-the-go. This tutorial walks you through a typical installation scenario and the basic features of MobileLog. Run setup. During the installation process, you will be asked whether you would like to install MobileLog in the default directory (recommended). The ADIFImport utility is provided to import logs from desktop packages. There are several considerations with regard to ADIF import. First, larger desktop logs will (obviously) require additional memory on your PDA and take longer to import. A desktop log containing ~2400 QSOs will result in a 680 kb database on a PDA and take ~25 minutes to import (due to database indexing during the import process which improves search and report performance). 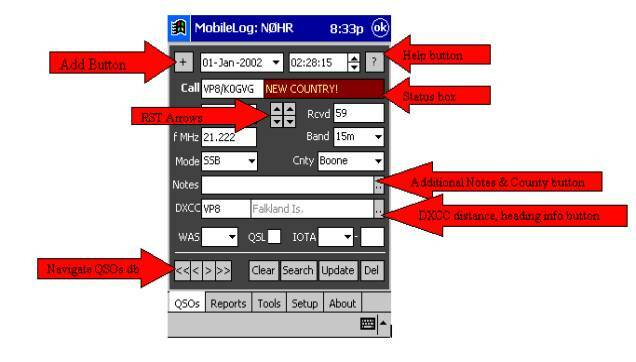 Secondly, there may be QSOs on your desktop that you do not want to include in your mobile log. 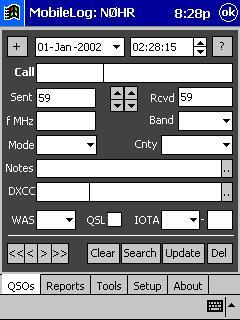 For example, you may not want to import 1995 Field Day QSOs in your PDA. If this is the case, I recommend that you use logging software that is flexible in how it creates ADIFs. For example, many desktop-logging apps will allow you to specify a date range. You may want to create several ADIFs (based on date ranges) or dump everything to a single, large ADIF file then manually edit it to remove unwanted QSOs. 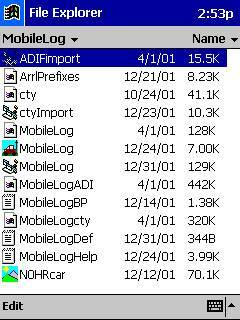 To import a log, transfer your ADIF log to your PDA (activesync explorer will work). 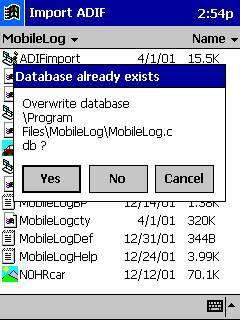 COPY THE LOG FILE TO THE MOBILELOG DIRECTORY - RENAME IT TO MobileLogADI.adi. Windows typically hides the file extensions, so be careful to make sure the adi extension is properly added (don’t end up with a file named “MobileLogADI.adi.adi”). Launch the ADIFimport utility by starting the PocketPC file explorer and changing to the MobileLog installation directory. Select ADIFimport.vb. If ADIFimport finds an existing log, it will ask whether to overwrite it (Yes) or append QSOs to it (No) or abort the process (Cancel). If you choose to overwrite the database, all previous QSOs will be dropped from the database and you will be notified that the database file has been created. Once the main ADIFImport screen appears, press the Start button. Several tasks are completed as QSOs are imported (for example, the DXCC awards status is updated, QSOs are indexed, …). As you can see, many of the ADIF fields are reported as the import proceeds. Once the import has completed, use the Cancel button. Warning, do not repeatedly import the same log file. In this release of MobileLog, the ADIFimport utility does not discard duplicate QSOs. 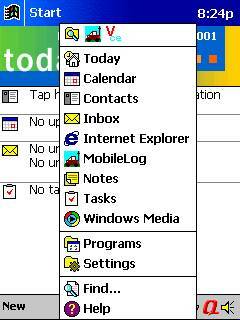 Your start menu should have a MobileLog icon. Select it. Several settings can be adjusted from the Setup screen. Once you have received a registration key, enter it along with your callsign. Set your timezone offset (hours from GMT). For example, to set MobileLog for Central Standard Time (six hours behind GMT), enter "-6". Set your latitude and longitude (in decimal format) using the lat/lon fields. lat/lon values in hours, minutes, and seconds format must first be converted. Use negative values to represent east and south. 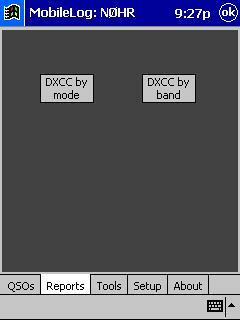 The bands, modes and counties fields are comma-separated values that control the combo boxes displayed on the QSO entry screen. Do not use spaces in these fields. 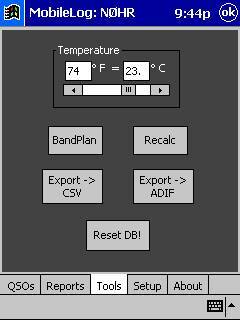 Modify the bands and modes fields to your typical operating habits. You may want to re-sort the fields to place your most used bands and modes at the top of the combo boxes. For example, if you frequently operate 20m-CW, make sure those are listed first. Note that renaming bands and modes to uncommon names will prevent the reporting tools from working as expected. For example, if you rename the "10m” band to "28mhz", the report will not credit those QSOs. The Counties field modifies the "cnty" field on the QSO entry screen. This value (if set) will be added to the notes field when ADIF log files are generated. Of course, if there is anything else that you'd rather track in "notes" and lends itself to a combo box (your rig, power, etc.) the feature will be handy. Use the Metric field to indicate whether you'd prefer distance in km. Colors can also be optimized for your PDA. 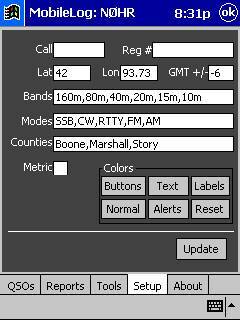 Fill in the necessary fields to log a QSO. - Callsigns should be entered in the "Call" field. If the station is operating portable (in another DXCC country), prepend the call with the appropriate prefix. For example, if NØHR is operating from VP5 (I wish! ), enter it as: VP5/N0HR. - RST fields can be modified manually (as you would modify any other field) OR by using the RST arrows. To use the RST arrows, click once in either the "RST Sent" or "RST Rcvd" then use either the left arrows to adjust Readability or right arrows to adjust Strength. - Frequency is entered in the "f MHz" field. As long as valid MHz (not kHz) values are entered, the "Band" field should reflect the frequency. - The band can be set with the Bands combo box. Some ops prefer to enter only the band (as opposed to the exact frequency), which is fine. - If applicable, set the Cnty box. - Enter any notes that apply to this QSO. - If you would like to track the other operator's county or have a lengthy note, use the ".." button after the notes field. - If the operator's DXCC prefix is incorrect, change it. Be certain to use the valid prefix representing that DXCC entity. If unsure, the prefixes are shown on the DXCC reports. - Once a valid DXCC entity is displayed, the ".." button may be used to get country information (heading, distance, zone, latitude/longitude, timezone, ...). - The WAS combo can be used to set the state. - The QSL flag indicates whether the QSO has been confirmed. - The IOTA fields can be used to track IOTA awards. NOW ENTER THE QSO BY USING THE "+" BUTTON. If you do not have QSOs in your database, create a few (above). Use the <<,<,>,>> buttons to scroll through your QSOs. Create an invalid QSO by following step 5 above (use today's date for this example). 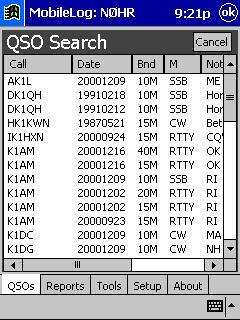 Scroll through the log to "lookup" this invalid QSO. Select the "Del" button to delete the QSO from the log. 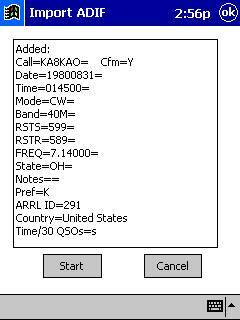 Use the Clear button to clear any data on the QSO entry screen. In the "Call" field, enter the callsign or partial callsign of a QSO in your database. For example, if you have worked "W1AW" enter that call. Note that the search process looks for partial call matches. That is, a search for "W1AW" could pull up contacts with: W1AW, KW1AW, and W1AWA which all contain the string of characters "W1AW". Because of this, if your log contains thousands of QSOs, narrowing your search by providing as many characters as possible will be beneficial, as opposed to simply entering "1" which would return every QSO containing a "1". Columns are resized or hidden by moving the bars that separate the column headings. Select “Cancel” when you are finished viewing the results. 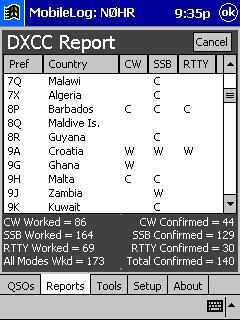 The "DXCC by mode" button is located on the Reports screen. Choose the Reports tab and select it. This screen can also be used to determine the "primary prefix" of various DXCC entities. The scroll-box in the center of the screen contains the country report itself. Each column is "sortable" and "resizable". To resize a column, click the dark line behind the column name in the header and drag it until the columns are the desired size. To "hide" a column, resize it until it virtually disappears. To sort the report based on a column, click on the column heading. For example, to sort the report based on CW worked/confirmed, click on the CW heading. Column sorting can be either ascending or descending. Click on the heading again to toggle. For example, to display countries that have not yet been worked or confirmed on CW at the top of the report, click on the CW heading a second time. Statistics for the various modes are displayed at the bottom of the report. Use the "Cancel" button to revert to the previous screen. This report displays DXCC status on a band-by-band basis and is similar to the "DXCC by mode" report. Running this report requires slightly more processing time than the "by mode" report. Use the Cancel button to exit the report. Open the tools screen using the “Tools” tab. Use the slider to quickly convert degrees Fahrenheit to degrees Celsius. 12) Display the ARRL bandplan using the "Bandplan" button. As new QSOs are added to the MobileLog database, the awards status is automatically updated. That is, if the QSO is for a new country, that country's award status is changed. However, to optimize performance, as a QSO is deleted from the log, the country award status does not change (which would require MobileLog to perform additional time consuming operations to determine whether the sole QSO for that country, mode, band combination was deleted). Recalc time for a ~2000 QSO log is approx. 3 minutes. Choose the “Export -> CSV” button. The program will prompt you to determine the scope of the export. 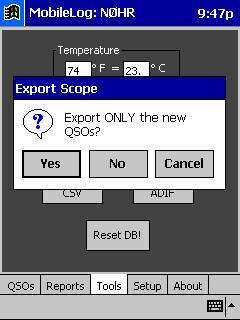 To export only the new QSOs (since the last export action), choose Yes. To export all QSOs in the database, choose No. If you frequently add QSOs to the database will on the road, choosing Yes will allow you to create a small log of your recent QSOs to resync with your desktop logging application (via CSV format). 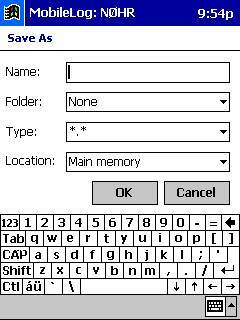 The “Save As” dialog will then prompt you to store the file on the PDA. This feature is similar to the “Export -> CSV” utility except that it creates a file in ADIF format. The About screen displays the build registration information.